SAFESKIN* PURPLE NITRILE* Dental Exam Gloves are a latex-free alternative for those individuals allergic to natural rubber latex. 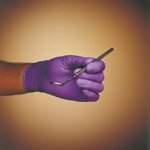 The distinctive COLOR PURPLE* helps users quickly distinguish the glove from other latex or synthetic glove options. They are powder-free with textured fingertips to enhance instrument control in both wet and dry situations.